The Details Tab of the Reader Team is where you do all of your set up work. The majority of items within this section already have information as to how they are used. We ask that you read those sections each time to ensure that you’re using them correctly. There are a few key items that we want to highlight here, though. Directly under the Update Reader Team Details button you’ll see the link that you will be sharing with people you wish to invite to your team. Above that is a preview page so you can see what your readers will see when they go to apply. 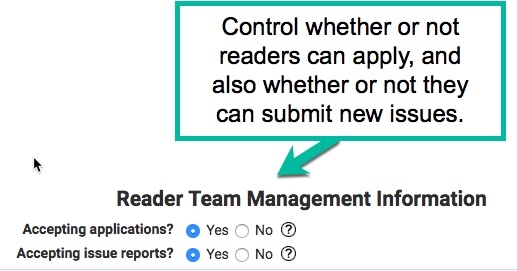 Since most Reader Teams only last a certain amount of time, you’ll want to control when people can apply to the team. Having someone apply to the team two days before it ends probably won’t provide them with enough time to fully participate. By shutting down the applications, you can make it so readers will see a message that the team has already closed. The same goes with issue reports. There will come a point where you’ll need to get in and fix all the issues reported so you can move the book off to your editor. It’s suggested that you set an end date to your issue reporting and that you close the issue reports at that point. 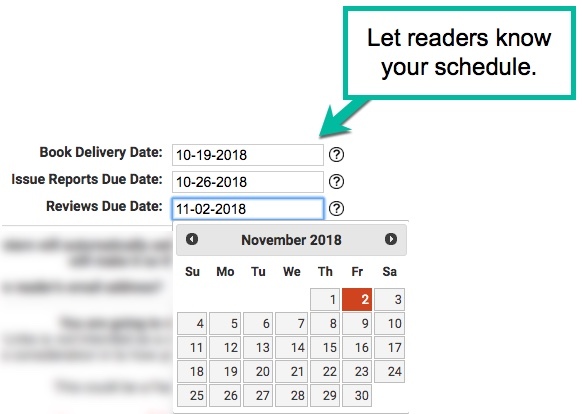 Your readers will see a calendar of dates on their view of your book page. To make sure they understand the schedule they’re working with, set the dates accordingly. Book Delivery Date: This is when you will be giving them the book to start in on their reading. Issue Reports Due Date: This is the date that you will be shutting down the ability for them to issue reports. Reviews Due Date: While it’s against Amazon Terms of Service for you to require a review in exchange for an advanced copy of your book, there will certainly be many members of your team who will want to leave a review. It’s typically best to put in the date that your book is going to release as the reviews due date. The application page will show the details of the book based on the information you enter here. Note that we do not host images, so you’ll need to use a URL for an image here. We typically just put our images on our WordPress sites and link to those. Also, ReaderLinks does not manage delivery of books to people. Our recommendation is that you use BookFunnel for this. In order for the readers to enter in issue reports, you’ll need to list out the chapters in order. This should be done one line at a time. You can use names, numbers, or a combination of both in here. Please refer to the animated image below to see how this is done with numbered chapters.